What Are the Costs of Libertarianism? Democracy in Chains, historian Nancy MacLean’s account of James McGill Buchanan and public choice economics, has caused an unusual stir in the few months since its publication. You may have followed the lengthy and determined attacks on MacLean, and the charges that she has misrepresented Buchanan’s work, on social media. Intellectual historian Andy Seal’s response to those criticisms here at Public Seminar has also drawn a storm of comments from MacLean’s critics. You might ask: what’s the fuss about? Certainly an accessibly written book about Buchanan, a Nobel Prize winning economist, was long overdue, particularly given the rise of libertarianism over the last few years. I’m surprised that no one more sympathetic to his views, but with some objective distance from the man himself, has written one. I found only two secondary sources when I searched, one of which was written by a former student and collaborator of Buchanan’s at George Mason. What has been particularly striking is that MacLean’s critics — mostly scholars linked to Buchanan himself, to the Cato Institute, and to The Center for Study of Public Choice at George Mason University — seem to have read only the first few chapters of the book. Prominent complaints are that MacLean has misrepresented Buchanan’s intellectual history, and that the book smears him as a racist. Nearly every historian I know who has read Democracy in Chains is mystified by the intensity of these complaints. One theme, for example, is that MacLean neglects the influence of Hobbes on Buchanan’s thought: indeed, Buchanan’s thoughts on Hobbes are not well represented, but who cares? The book isn’t about Hobbes, nor is it written for dedicated Buchananites who might have reveled in a few thousand words about Hobbes. MacLean also over represents the influence of slave-owning political philosopher John C. Calhoun, they argue; but MacLean’s extended analysis of Calhoun is not intended to amplify Buchanan’s intellectual history, but to explain why the South was fertile ground for modern libertarianism. To me this seems like not very careful reading, even as these critics pepper one with quotations, often edited, taken out of context and massaged to “imply” things that they don’t imply at all. My own engagement with some of these people on social media, while often tedious and repetitive, has also made me aware that these men (they are all men) take their connection to Buchanan very personally, and appear to believe that the possibility that MacLean has “smeared” Buchanan as a racist implicates them as well. But there is something else at work too in this campaign. Exaggerating the role that race actually does play in MacLean’s analysis of Buchanan’s work is also a convenient distraction from the larger picture Democracy in Chains proposes: exposing the mostly backstage role that Buchanan played in taking libertarianism from the intellectual fringes to the academic mainstream. These stakes are potentially quite high. What MacLean has done is to chart the normalization of a well financed form of conservative sectarianism that seeks a transformation, not just of the United States economy, but of the economic theories that undergird public spending around the globe. Worstall’s summary of Democracy in Chains is deeply misleading, both about MacLean and the benign simplicity of public choice economics, unless you are getting all your news about the book from libertarian Twitter feeds. I read the book after the controversy was well underway and found not one sentence that substantiated either of these statements. I saw just the opposite. MacLean goes to some length to actually not say that Buchanan is a racist, displaying a form of writerly craft (not to mention tact) that every modern American historian should emulate. How she handled the issue raises some important questions: What does the word “racist” actually mean? How do we contextualize racism as a dynamic lodged a set of specific political, social or economic events? When do — or can — scholars use such a word effectively, if ever, and not risk a loss of precision? How do we think and talk about those whose ideological beliefs accept racial inequality as an acceptable cost of a given policy? Does our modern understanding of what a “racist” is and does cover whites who have benefitted from segregation, but failed to acknowledge an ethical relationship to people of color? These are all questions to which MacLean appears to have given great thought as she wrote the early chapters of Democracy in Chains. Her description of Buchanan’s rise to prominence within the context of Virginia’s long history of slavery, Jim Crow law, and segregation is grounded in well-established historical facts. She also draws on a historical consensus (which is apparently not shared in economics) that these phenomena have had consequences for how whites and blacks understood their worlds — and each other. I don’t know any historians, conservative or liberal, who would dispute this, although apparently libertarian economists do. Racial segregation was calculated to deprive African American people of access to public accommodations and to social benefits that their tax dollars and fees paid for, usually without any right to to political representation. As MacLean notes, Buchanan leaped to the defense of segregationists when challenges to Jim Crow segregation gathered momentum after World War II. He encouraged white policymakers who feared that racial equality would pry open the door to social and political change, racial and otherwise to stand firm against federal court orders. But MacLean never says Buchanan did this because he was a racist: his primary motivation was that the social and political crisis of desegregation created an opening for his own scholarly work. By 1954, the year that Brown v. Board of Education was decided, Buchanan had already begun to develop the theories that would make not only make him famous, but also distinguish him from the Chicago and Austrian schools that had influenced him. Wedding economics to political theory, public choice theory postulated that no one could be free of economic self interest simply by becoming a politician or policy maker. Claiming to act on behalf of the “public good,” progressives were, in reality, “rent seekers” who sought to solidify their influence among the masses by redistributing tax dollars and rights through new social policies. In this context, the expansion of civil rights by politicians was simply another form of rent seeking, the expansion of democracy an invitation to corruption. Buchanan, his intellectual allies, and his graduate students may not have actually believed that their reason for supporting massive resistance to Brown was to preserve the exploitative and violent racial order of the South. I am willing to be open minded about that, and clearly MacLean is as well. In fact, I would actually love to see someone illuminate this further. What we do know from MacLean’s research, however, is that for Buchanan, Brown promoted his ambition. It was an opportunity to strike a blow against the most basic democratic, tax payer funded, entitlement that existed — the education of the poor. Public education, segregated or unsegregated, relied on reallocating tax dollars and enforcing the collective good. 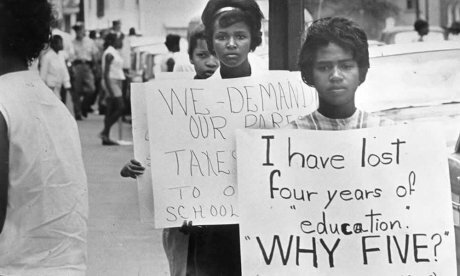 Like many in the school choice movement today, Buchanan found the whole idea of compulsory, tax-supported public education noxious: when Prince Edward County, Virginia closed its public schools in 1959, defied order after order to reopen them, and permitted white parents to open so-called “segregation academies,” it proved that there was a way forward — however narrow — for public choice as a theory of governance. Sound familiar? Sure it does. It’s the intellectual kernel of what has become the home schooling, charter school and voucher movements, in which activists attempt to reclaim their own tax dollars to educate their children in ways that they choose. But here’s the question I would love to see answered, and it may lead back to why Buchananites are so sensitive on the racism question. What Buchanan did may have been principled, and it may have been an intellectual experiment, but he was clearly on the wrong side of history — even at the time, since most white Virginians were inclined to capitulate to integration in order to save their schools. So you have to ask: what kind of a person takes a look at the dilapidated schools black children had available to them in 1950s Virginia, and not only fails to develop any empathetic response, but also determines that the correct response is to put a stop to education for an indefinite period of time? What kind of a person looked around the campus at all-white University of Virginia and decided that that was what the intellectual world should look like in perpetuity? You find a word to describe that person. Whatever his personal beliefs about race and racism, Buchanan was clearly an ambitious man who took advantage of the chances life presented. What this also meant was cutting sweetheart deals with universities like Virginia Tech, The University of Virginia, and George Mason University when they were undistinguished, underfunded and in need of some glamour. In exchange, Buchanan demanded — and received — a free hand with hiring and grad student admissions, raising millions to support his institutes from wealthy donors who sought to expand the political and intellectual influence of libertarianism. In fact, one aspect of MacLean’s story that I have not seen disputed is that as Buchanan became more influential as an economist, and as a fundraiser in a conservative network that eventually included the Koch brothers, he was able to demand more autonomy from his home institutions, as well as from the norms of academic hiring and graduate admissions, even when they evolved in the 1970s to emphasize competitive searches. Does this make Buchanan uniquely horrible as a human being? No — and MacLean makes it clear that he was a beloved teacher, his various institutes hives of intellectual excitement and camaraderie (where only libertarians were allowed in.) Here MacLean has opened another door that subsequent historians should rush through: the role of colleges and universities in accepting money intended to mainstream extreme forms of conservatism. Universities, institutes, and think tanks provide legitimacy for ideas. An institute, or program, easily disguises agenda-driven research of all kinds: it is why many institutions, while they may accept funding from some of the same sources that funded Buchanan, don’t accept those funds if a particular research or teaching outcome is required. But the universities where Buchanan made his home over the years put such scruples aside: when they arose, Buchanan moved his work and his money elsewhere. Buchanan — like the many economists associated with the Chicago school and Austrian economics — understood that libertarian economics told an alternative story about what democracy was, and why a strong state unencumbered by checks, balances and civil rights was the best hope for freedom. Interestingly, there has been an almost complete silence among MacLean’s critics about her chapter on Buchanan’s role as a critical constitutional and economic consultant for the US-backed Chilean junta in 1980. By helping the new government legally eliminate its political competitors, the economist also helped set the stage for decades of dictatorship, oligarchy, exploitation and the collapse of Chile’s economy . This opens another important lens on our contemporary moment: the libertarian craving for political strongmen who will represent “freedom” while keeping a firm thumb on majority rule. Witness the hopeful glee among some libertarians that Donald Trump’s chaotic destruction and neglect of the government he was elected to lead will bring their glorious revolution ever closer. In fact, MacLean and her critics have a core disagreement, less about how to do history (as these detractors claim), or about who is or is not racist, than about whether libertarianism itself is an ethical political philosophy that is consistent with modern democratic governance under advanced capitalism. You don’t have to have an extended quarrel about Buchanan’s intellectual biography to make an argument that he, his Virginia school, and Chicago economists like Milton Friedman, have promoted the dominance of the 1% as the best form of democracy. By making this point central to the book, MacLean has, in fact, called attention to something far more insidious about libertarianism than any racism for which it may be responsible: that its proponents view human suffering and deprivation more typical of the nineteenth century as an acceptable price for the society they wish to bring into being. With their faux outrage about the impugning of Buchanan’s reputation, MacLean’s critics have attempted to obscure important questions her book raises about the scope and ambition of the libertarian movement, as well as its costs to democratic society. What do small government conservatives and neoliberal policymakers think they are doing when the most obvious and immediate effects of not redistributing tax money to public institutions and programs are to cause demonstrable, human pain that, for many, will be unrecoverable? What does constitute a kind of bad luck, deliberate aggression against the poor, or ethical malpractice that cannot be explained by economic theory or parables about freedom and personal responsibility? What ethical ties wed the fortunate to the unfortunate, and how should those ties be strengthened or reinforced by law and the state? That said, the failure of these MacLean’s critics — and let’s say Buchanan — to take race and racism seriously, at all, as a force that has shaped American history, is striking and worth pausing on. Being “race blind,” as many different kinds of conservatives say they are, may, in fact, lead to fundamental misapprehensions about the world. Consider, for example, last February, when Secretary of Education Betsy DeVos mischaracterized historically Black colleges and universities (HBCUs) as “pioneers of school choice.” This was widely recognized as a completely idiotic and ahistorical statement, since for almost a century after many of these institutions were founded most African-American people were largely excluded from institutions that were not HBCUs. Yet, one has to ask: why does a woman who may be wrong about many things but is actually not an idiot believe something that peculiar? The answer, I think, is the role that ideology plays in libertarian historical thinking. DeVos may, indeed, have thought that HBCUs were not dissimilar to the segregation academies that sprang up under the tutelage of policy intellectuals like Buchanan, privately segregated schools where white parents “chose” to send their children in response to Brown. Perhaps this falsehood — that black students were happier forming their “own” schools — has taken on the status of truth among libertarians. Furthermore, if your ideological position dictates that race and racism have never been a barrier to anyone’s individual progress, and in fact do not exist, how else would DeVos understand the continued existence of HBCUs at all? This is what is at stake in America today in our debates about health care, education, housing, energy, and even clean water: must the wealthy live in some ethical connection to the rest of the country or not? And what are the consequences for the nation, and for democracy, if they don’t? Democracy in Chains puts these questions front and center, and — whether you are conservative or liberal — could not be more important to thinking about the next stages of reclaiming our public sphere. 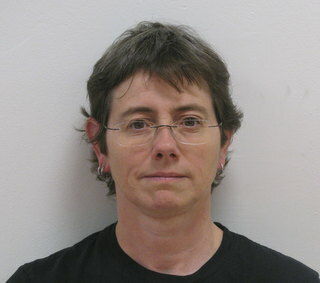 Claire Potter is Professor of History at The New School and Executive Editor of Public Seminar. You can follow Claire on Twitter.